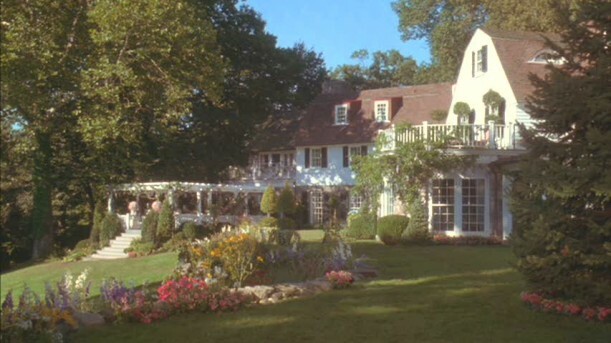 The 2004 remake of The Stepford Wives starred Nicole Kidman and Matthew Broderick as a couple that moves to the picture-perfect suburbs of Connecticut, only to discover that things may not be as idyllic as they first appear. The problem with this version is that it’s not sure if it wants to be scary or funny, so it’s not enough of either. 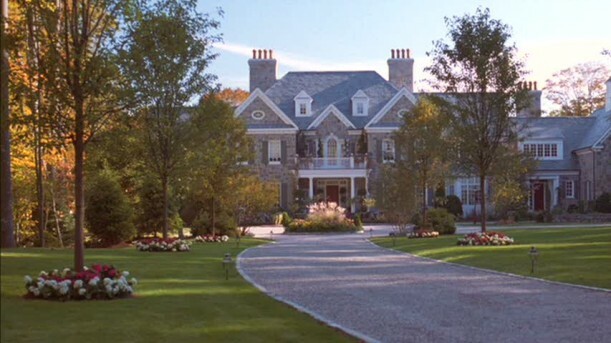 The houses that the Stepford families live in are pretty impressive, though, so let’s take a closer look! 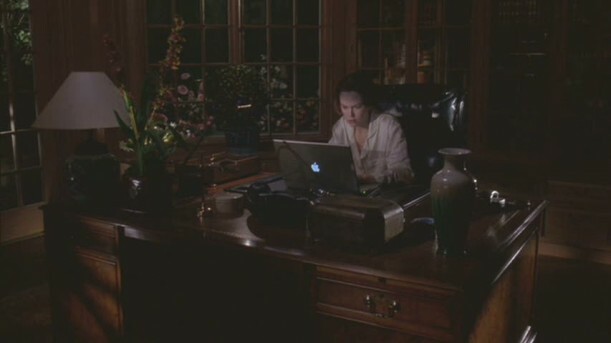 We get a look inside the study when Joanna starts frantically Googling various Stepford wives to see who they were before moving to Connecticut (surprise–they were judges, attorneys, and other high-powered career women like her!). John Cusack was originally cast in the role of Walter Eberhardt. When he dropped out, Matthew Broderick took over. John’s sister Joan was supposed to play the role of Bobbie, but she also pulled out and Bette Midler got the part. 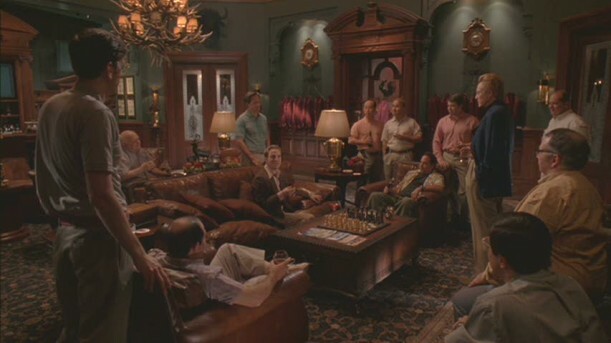 The Stepford Men’s Club was also a set. I guess I should mention that if you haven’t seen the movie and don’t want anything spoiled, you might want to stop reading now. 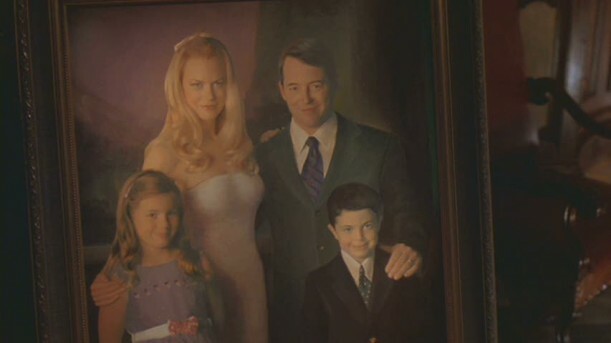 In the next scene, Joanna looks like the image in the painting. 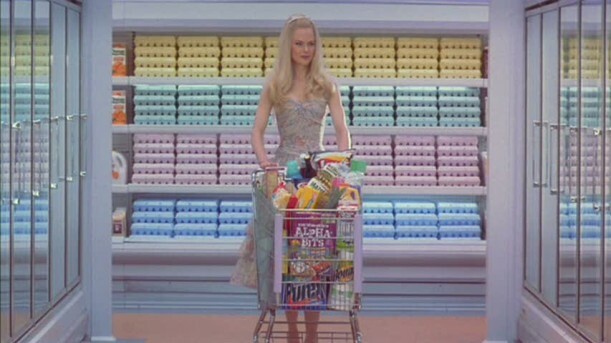 Frank Oz says he wanted it to look like she was “floating through the grocery store.” I like how they lined the egg cartons up. 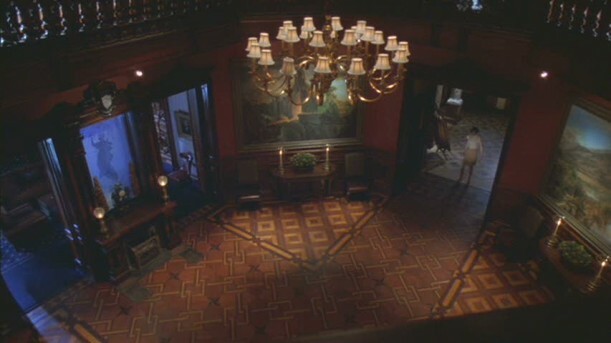 The interiors of Bobbie’s house were created on a soundstage in Queens. I won’t even pretend to understand the movie’s logic. Are the wives stuck with robotic bodies now even though their brains have been restored? How does that work? They clearly wanted to give the wives a happy ending, but it was all a little strange. The original film went out on a much darker note. 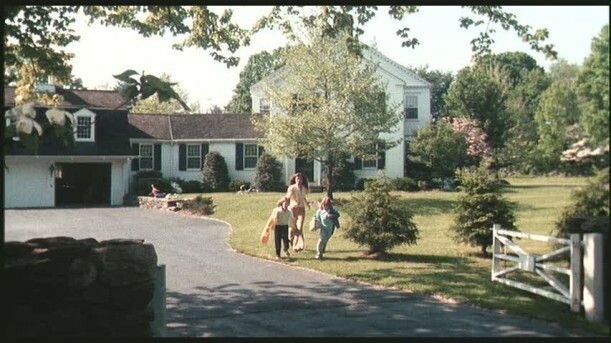 The various house exteriors that are shown throughout the movie were photographed in the suburbs of Connecticut. 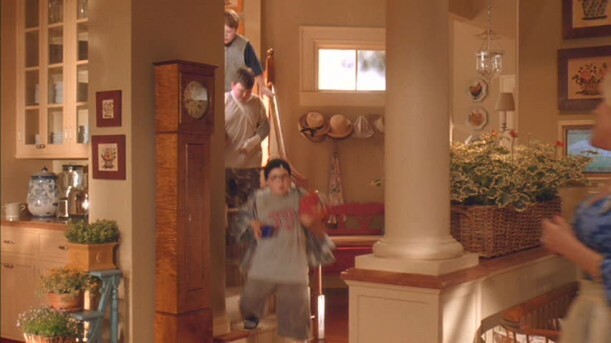 The Colorful Queen Anne Victorian in "Meet the Fockers"
I love your movie set reviews. This one made me want to rent it just to see Bobbie’s house. It was very pretty. I remember not liking the movie much but the sets are fantastic. I look forward to every Movie Monday! 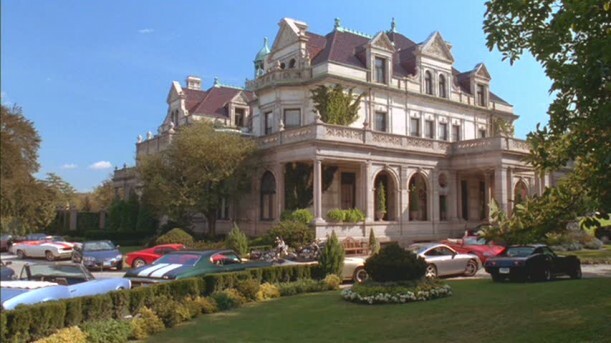 Hi Julia, the Lockwood-Mathews Mansion in Connecticut was used for the Stepford Men’s Association. It is an incredible place! Thanks for doing a terrific job showing all of the movie magic! .-= Marcy´s last blog ..I’ve changed… =-. I always wondered about the exterior of the Men’s Club in the first version. It looked to me a lot like Mark Twain’s house in Hartford. Anybody know about that? Hi Julia! Oh, this was a wonderful post! Can you imagine houses like these? 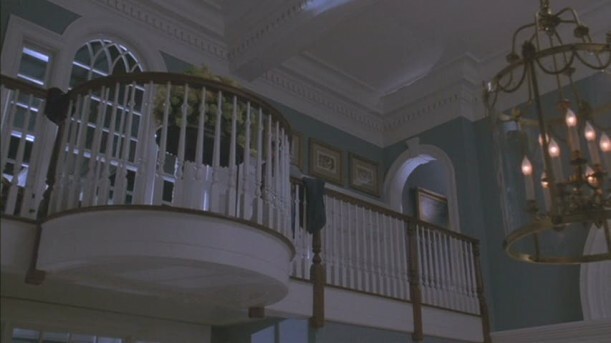 I think I liked Bobbi’s house better of the two. I saw this movie and was so disappointed! I didn’t like the Matthew Broderick character. He seemed stiff to me. But I do remember the original and liked it. Did you know they even made a sequel to the original? Well, again, you’ve out done yourself with all the research you must do to show us these houses and then all of the info to go along with it. I loved the old movie–it was so creepy and smart. The new one, not so much. Like you said, it couldn’t decide what it wanted to be. I think it’s interesting that back then, “new money” tried to look like “old money” by buying beautiful old houses and trying to act like they’d lived in them forever; now they buy up beautiful old houses, tear them down, and put up big ugly compounds with no landscaping, so it always looks like they just moved in. Very interesting Julia. It is great to see the differences in the sets/ scenes, and that scene at the grocery store is eerie!! .-= Linda Green´s last blog ..MERMAID TABLE =-. What a great post! I haven’t seen any of the movies and I’m not sure whether I want to or not. The mansions are amazing though. My favorite is Joanna’s. 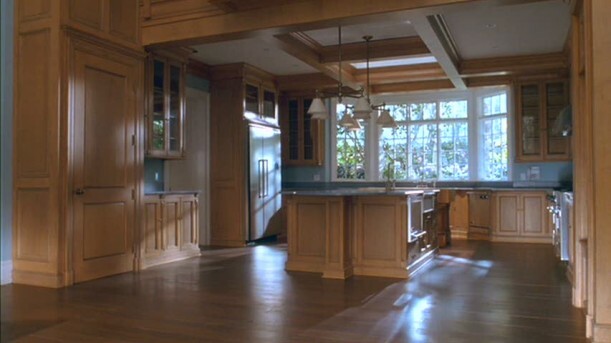 The kitchen, great room, staircase, and more, are to die for. I would love a house like that. 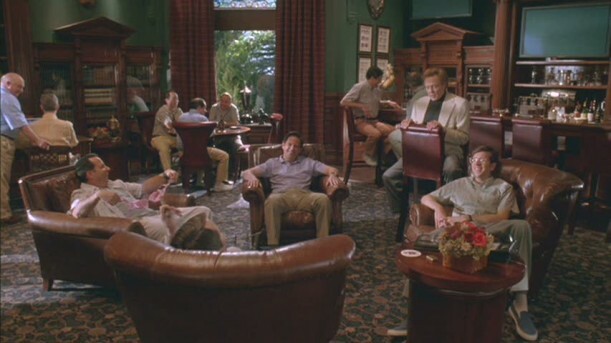 I love all the great leather couches in the room the men are chatting in. .-= Juju at Tales of Whimsy.com´s last blog ..Christian Historical Fiction Contest- Pearl in the Sand =-. Fun post! Very interesting information. Thank you for all of your hard work!! .-= Vicki @ In The Sandbox Comic Strip´s last blog ..Walnut Festival Fun Run =-. How neat to see the side by side comparison of these two sets!! I love it, and both houses are really beautiful. Believe it or not I haven’t seen either movie, I’ll have to put them on my list!! .-= Nancy@marcusdesign´s last blog ..a trip with a lifetime of memories =-. Insert Wm R. Blue remake meme here. I watched this movie being filmed all over my town, New Canaan, CT. Everyone was so super nice and it was so fun to celebrity-stalk the stars that had rented houses there while they were filming, most notoriously Faith Hill & Tim McGraw. They transformed the whole downtown that summer into Stepford! Can you believe I have never seen either of those movies? Now, I am intrigued, although I am far from every attaining Stepford Status, nor would I want to. 🙂 Love this peek inside. .-= Jen@Balancing Beauty and Bedlam´s last blog ..Figuring Out the Best Colors for Your Skin Tone =-. Great post, as usual, Julia! You are the master of HOUSES! Film, celebrity, cottage, every house imaginable! Now on to the Stepford Wives. Yeah, I saw both movies too. I LOVED the first one with Katharine Ross and loved, as you say, the “dark” ending. I really didn’t care for the second one with Nicole Kidman – you’re right: was it trying to be a comedy or scary? And I REALLY didn’t like the upbeat ending half as much as the first Stepford Wives ending! Well, thanks for this post, I thoroughly enjoyed remembering both movies. .-= Gloria´s last blog ..Im Making Room for Thelma and Louise =-. .-= cailen´s last blog ..rain- rain dont go away =-. 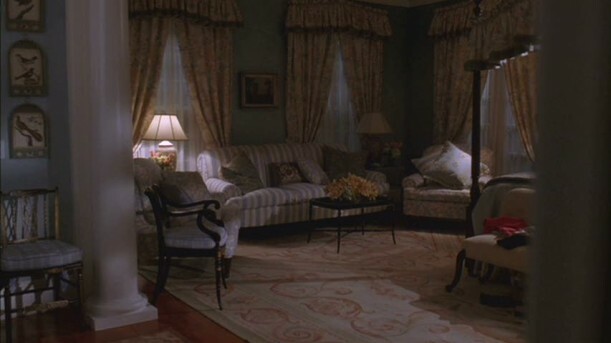 Is it just me or are there a TON of chairs in Joanna and Walter’s Bedroom? And they’re all facing the bed. Yeah for another movie house! I love seeing all the fun sets that are always perfectly designed. Thanks! I haven’t seen this movie. All the house shots make me want to. Great post Julia! Love these sets! 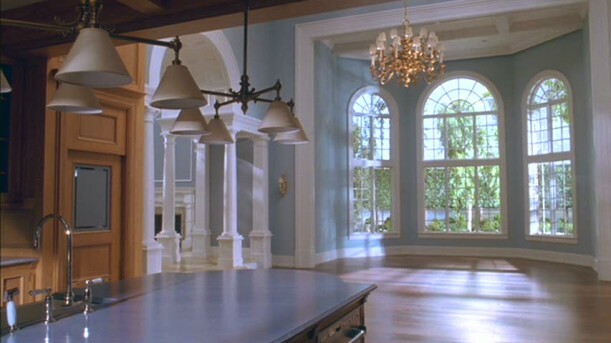 I’ve never seen the movie (except the the five minutes of the END I saw while channel surfing, so now I know what happens in the final scenes, lol) but these sets are gorgeous! I might have to check the movie out now! 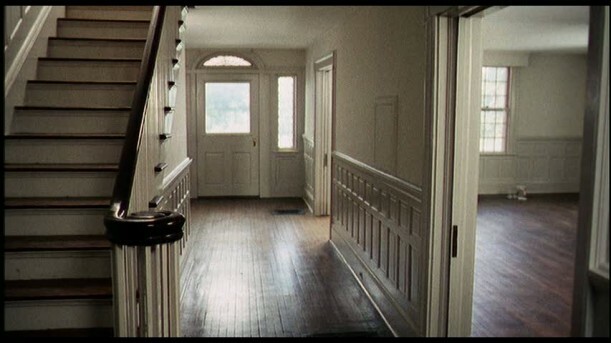 From now on, every time I watch a movie, I’ll be watching to see how far they open the front door! .-= Struggler´s last blog ..Creative Earthquake Decor =-. I’m from a neighboring town from where they filmed this. 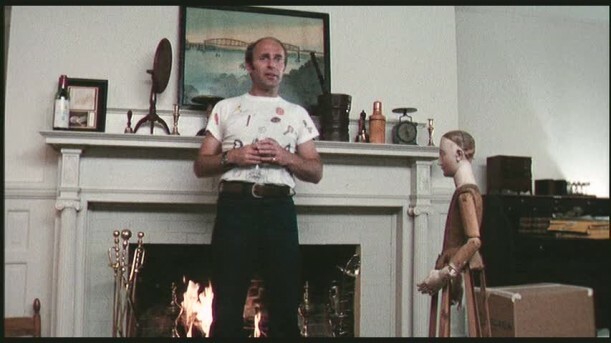 I think it is so strange that the residents of tis town are all proud to be from “Stepford.” I think the whole premise of robotic inhabitants of obscenely huge houses is totally lost on them. They just see it as a showcase for their beautiful estates. Very funny to me. .-= Jessica´s last blog ..Pink Handles-done! – =-. How do you manage to top every Movie Monday? 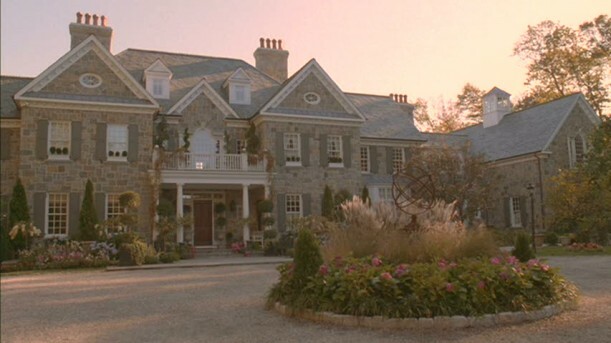 I LOVED the over the top McMansions in the Stepford Wives. I’ve only seen certain parts of the original film, so I really loved the comparisons. The director definitely got the shot he was looking for with Joanna/Nicole at the grocery store. She looked beautiful, ethereal, and downright creepy all at the same time. Lesson learned: perfection= creepy and unnatural. 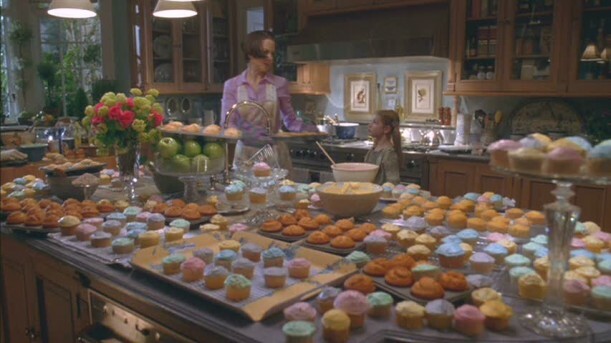 I’d still love to bake in those kitchens though! .-= Bre´s last blog ..Spotted- Gossip Girls Take NYFW =-. i’ve always loved the original… haha i used to love her clothes!! .-= Lauren´s last blog ..Pure Project 16- Spruce Up the Yard =-. 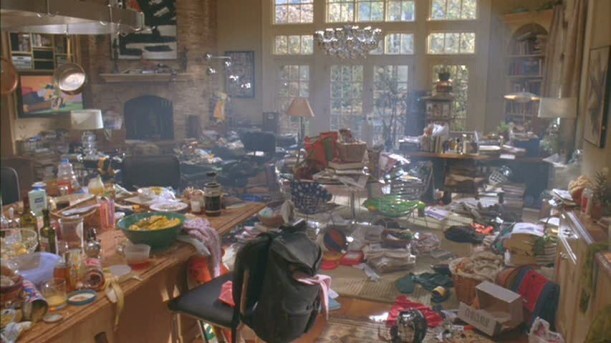 I much prefer the original house. I love the house in the movie Kiss and Kill, did you project to write an article on Ashton Kutcher and Katherine Heigl amazing house. Thanks ! The comment struck me funny about doing the dishes by hand(gasp! )….up until a year and a half ago, I had done the dishes by hand since 1993! My new house has a dishwasher! Woo hoo! Thanks for this fun post! 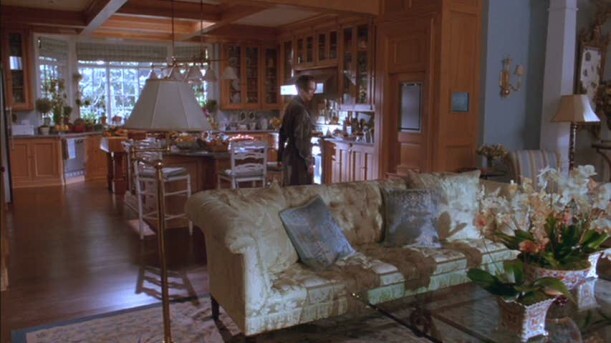 The kitchen/sitting room/eating area in Bette Midler’s home is a new all-time favorite. .-= Heidi @ The Good Stuff Guide´s last blog ..Manhattan Living =-. I think the first one’s plot was better, but in my opinion the remake could’ve been amazing. 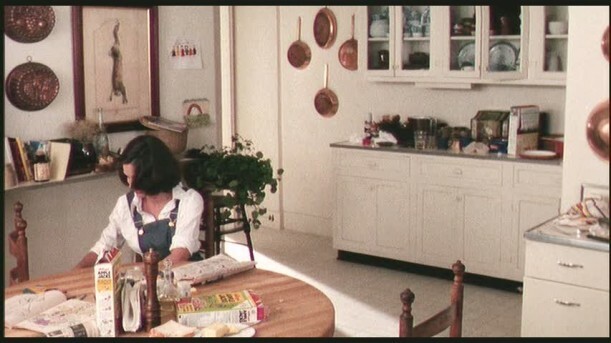 They had almost everything right, the cast, the set, ( looked exactly as I pictured Stepford when I read the book) but they ruined everything by trying to make it a comedy. This makes me want to watch the original again. I was pretty little when it was out so I don’t remember anything other than it being scary. Hi Julia . I miss you and your great blog. This house is gorgeous, but they might want to go to one of your top ten sights and find out about de-brassing some of those chandeliers! I don’t know why those look so dated, but they just do . Still a dream house for sure. Thanks! 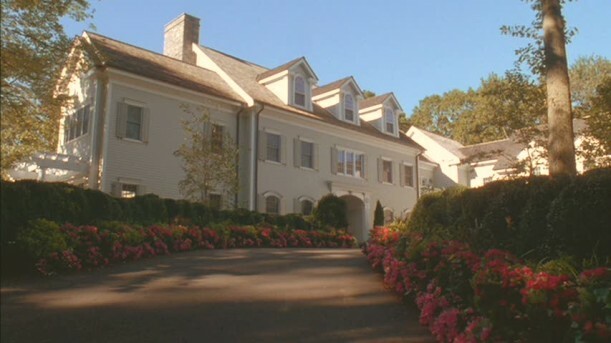 The Lockwood-Matthews Mansion was featured in the original movie, but for the exterior of the Stepford Men’s Association in the remake, they used “Estherwood” in Dobbs Ferry, NY.